That’s a question we’ve been asking a lot in our house. We’re in the market for a new device, and we’ve had a bit of trouble deciding exactly what we need. The kids are very much in favor of a tablet, since it’s so portable and a lot of fun for playing games. On the other hand, hubby and I are leaning toward a laptop, just because laptops have great computing power, and they make typing easier. But what if we didn’t have to choose? 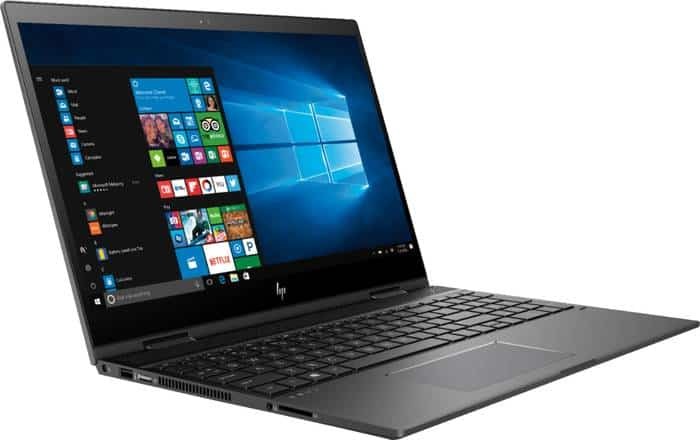 Right now, there’s a great sale at Beat Buy for $100 off the HP Envy x360 15 inch and the HP Envy x360 13 inch at Best Buy until July 28 2018! See the HP Envy x360 15 inch here! 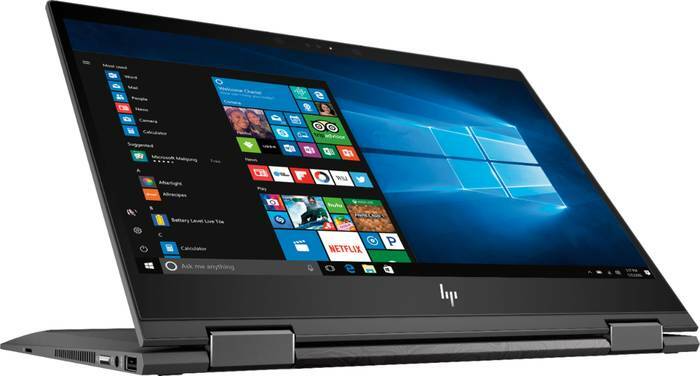 Click here to see the HP Envy x360 13 inch at Best Buy! The HP Envy x360 transform quickly from a laptop to a tablet in seconds. They’re a 2-in-1 device that comes with a touch sereen, Windows Ink, and a Windows operating system. Plus, their AMD processor makes them fast and thin so they’re incredibly portable. We’ve owned a 2-in-1 device for about three years now, and absolutely love it! It’s portable, fun, and easy to transform from tablet to laptop and back again. That said, three years is a lot of time in the tech world, and our device is getting a bit out of date. We’ve been looking for a replacement, and found six reasons the HP Envy x360 is a great candidate for our next laptop. There’s a great sale on right now! 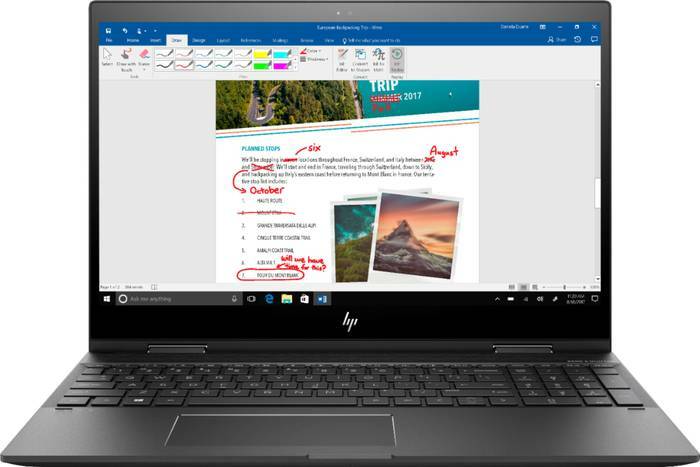 Right now at Best Buy, you can save $100 on the HP Envy x360 15 inch and the HP Envy x360 13 inch! We’ve long been Microsoft Windows fans in our house, and we’re loving Windows 10. It brings back the Start Menu from Windows 7 and comes with a lot of great new features, including the cool Edge Web browser that lets you markup Web pages on your screen. Windows Ink lets you jot jot down notes and ideas easily and quickly. I absolutely love this idea, since it lets me take notes as I go. We put this at number three on our list, but honestly it should probably be higher. With kids who want to have a tablet, and parents who want a laptop, the 360° flip-and-fold design lets us easily switch between laptop, audience, tabletop, presentation and tablet modes. So cool! The kids love the option of a touch screen tablet and laptop. Honestly, since I started using a touchscreen a few years ago, it’s been hard to go back. I especially love the touch screen when we’re traveling and I don’t have my mouse for the laptop. Using the touchscreen to scroll and tap is so much easier than using a mouse pad to scroll. Plus, the HP Envy x360’s 1920 x 1080 resolution has really impressive color and clarity. It includes natural finger-touch navigation that makes the most of Windows 10. Add to that IPS technology for wide viewing angles and energy-efficient WLED backlight and it’s a pleasure to view. Having enough RAM is crucial. Without it, your computer can seem slow and glitchy. Luckily, the HP Envy x360 comes with 8GM substantial high-bandwidth RAM. That means that games and photo- and video-editing applications will run beautifully, plus you can run multiple programs and browser tabs all at once. What did you decide – laptop of tablet? Or did you go for a 2-in-1 device that does both like the HP Envy x360?